Jon Gomm demonstrates some real lateral thinking on how to use a guitar. I’m in the process of upgrading a lot of my earlier AAC/MP3 files to 256kbps AAC. The ones I ripped some years ago tend to be lower quality than that, but it’s been too much hassle to go back to the CDs and update them. Now, of course, everything is much easier. 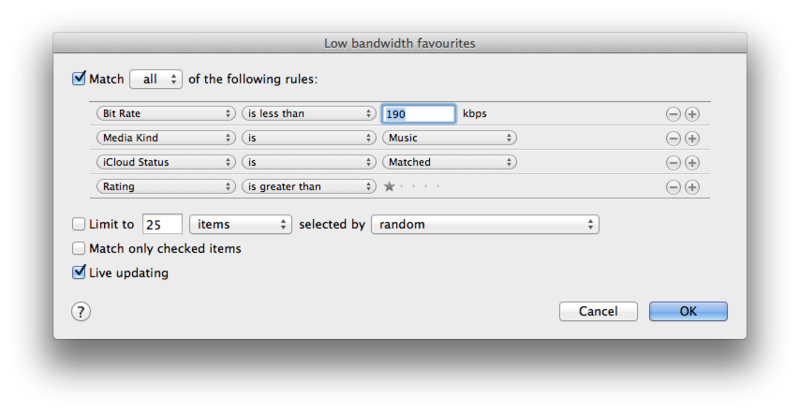 I’ve subscribed to iTunes Match, which, for those who have missed it, is a new 22-quid-a-year service from Apple. Basically, it means that if you have a track on any of your machines, you can listen to it on all of them. It looks at what’s in your iTunes Library, and attempts to match it with what they have online. If it finds a match, wherever you got the original from, then you can get a high-quality 256kbps version from the cloud…. straight onto your iPhone or Apple TV, for example. However, as far as I can see, there isn’t a way to make it automatically replace the songs in your iTunes library with the higher-bitrate versions. It needs a little encouragement – basically, once the match process has completed for your library, you need to delete each low-bandwidth track from your local machine and download it again. Don’t worry, it’ll preserve your ratings, playlists etc. Just select the track(s) in your iTunes and press Option-Backspace. (Cmd-Backspace will also work in the main library, but not in playlists). 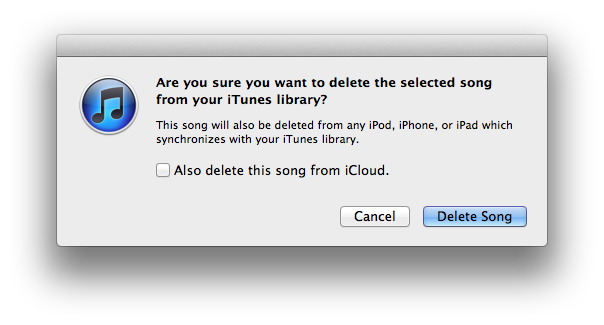 and note that you’re given the option of deleting it from iCloud; don’t select that! Then you’re asked whether you want to keep the old files or move them to the Trash. I don’t want too many versions hanging around, so I shift them to the Trash, relying on Time Machine in case something goes wrong. At this point you should see the entry still in iTunes, but with a little cloud icon indicating that it’s not on your local machine. If you were to start playing it, it would download automatically, but you can also right-click on it and select Download. And there you are, you’ve upgraded your fidelity! This isn’t too convenient for bulk operations of many tracks at once, and you want to be a bit cautious about tracks for which iTunes didn’t find a match. It’s quite easy to delete them and find that download isn’t an option! With this, I can browse my highest priorities, select a bunch of them, and delete them easily. Other systems may work better for you – recommendations welcome – but I hope this is a useful starting point! One thing you should note about iTunes Match, particularly if you are squeamish or have any nefarious purposes in mind: the high-quality AAC files you download will contain your name and Apple ID.